Kozanów – In Search for the Miraculous – agitPolska e.V. Kozanów – In Search for the Miraculous, is an interdisciplinary artistic event presented within the ‘Wrocław — Backyard Door’ as part of the Visual Arts component of the European Capital of Culture Wrocław 2016 programme. 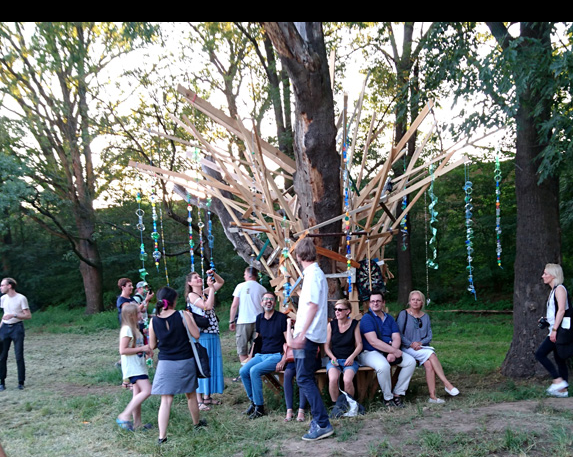 Its main element is an international group exhibition situated in the Kozanów neighbourhood and its surroundings, which is accompanied by performances, films and discussions. In their site-specific works, as well as interactive activities with the inhabitants of the area, the invited artists from different European countries refer both to the history of this micro-region and to its every day reality. We chose the Kozanów neighbourhood for our activities because of two reasons: its interesting history up to the present, and minimal cultural offer. In Poland Kozanów is best-known for the usettling photos taken during the flood of the century in 1997, portraying colourful multi-storey blocks of flats standing in the water. Presently, apart from a senior’s club and a local library, there is only one culture club in the neighbourhood whose offer is directed basically to children. Kozanów – In Search for the Miraculous project is first of all intended for the inhabitants of the area, whom we wish to encourage to confront with artistic activities both directly – becoming the co-creators of the works, and indirectly – participating in discussions concerning the site-specific installations created by artists to be located especially in the neighbourhood. The title of the project refers to a work by a Dutch artist – Bas Jan Ader, consisting in sailing the Atlantic in a small sailing boat, during which the artist perished, and his body was never found. The mystery of the unexplained cause of his disappearance and the optimistic vision of his artistic output became within the art world a kind of symbol of striving for a better future. Ader’s work title was in turn borrowed from a Russian spiritualist philosopher – Peter D. Ouspensky and his oeuvre „In Search of the Miraculous“ in which he encourages the reader to „wake up from“ the normality and strive towards a better life. Kozanow – in search of a Miraculous from Vasilis Flouris on Vimeo.